Every experience that we outwardly have is created in place by our internal magnetic force. This magnetic force is comprised from our intent, our expectations and our emotions. The energetic flow that carries these intentions, expectations and emotions is the chakra system. As we view any light bulb, the halo of light that is produced by the bulb is readily apparent. This halo of light is created by the inner components (or filament) of the light bulb. Now, compare this halo of light to the aura of our physical bodies. The aura is the corona of energy that surrounds us. This energetic halo is responsible for the magnetic attraction or deflection of the events of our lives. Our energetic halo is created by our inner filament of the chakra system. The thoughts, expectations and emotions that reside in our chakra system fuels the magnetic pull of our auras. Become aware of your physical body. Allow your eyes to close or to gently focus. Focus on your breathing. With each breath, allow your physical body to relax. Working from the top of your head to soles of your feet; each breath in welcomes calmness and serenity – each breath out releases the tension and the fear to the healing atmosphere that surrounds you. As you physical body relaxes, shift your physical awareness from the outside to the mindscape of the inner planes. With each breath that you take allow the mind to release the physical thoughts and images that drift through. With each breath, allow yourself to feel the energy as it flows through you and around you – Divine Source energy that is perfectly attuning the inner and the outer balance of your mind, body and spirit. Each breath that you take in unifies the “as above” of the energetic divine vibration with the “so below” of your physical energetic vibration. Each breath that you release blends your core of desire, intent and emotion with your energetic divine source. Each breath that you take allows the boundaries of inner and outer to soften until you are flowing as a unity of Divine Creator and creation. Allow your energetic senses to become aware of your vortices of energetic flow. As you focus on each energetic swirl; focus on any messages that reside within the energy. Allow yourself to affirm the messages that fuel your life. Allow yourself to release any messages that no longer serve you to the Divine energy for healing and re-messaging. Begin with the soles of the feet. Focus your breathing on your soles. Feel them relax and feel them firmly cradled within the energy of the earth. You feel the energy vortices of your feet root deep into the earth to receive the nourishment of the earth mother and to “ground” the energetic flow into physical reality. Move your awareness up to your tail bone area. Become aware of the swirling garnet red energy of the root chakra. This energy is the energy of the physical “I am.” This is our physical energy – our right to thrive – our right to be here on earth. Be with your awareness of this energy. Take a deep breath in and as you exhale, release any messages, thoughts or perceptions that no longer serve you. With each breath that you take, affirm that Source energy is assuring that energetic flow creating your Highest physical progression. The garnet red blends to the tangerine orange energy between your pubic bone and your navel. This sacral chakra is the energy of “I connect” with others and “I create”. This creative energy is also the flow of our desires and pleasures. Be with your awareness of this energy. Take a deep breath in and as you exhale, release any messages, thoughts or perceptions that no longer serve you. With each breath that you take, affirm that Source energy is assuring that energetic flow magnetizing your Highest sense of joy. The tangerine orange flows to the sunny yellow of the solar plexus chakra. The energetic swirl is located from the navel to just beneath your rib cage. This chakra is the energy of “I manifest.” This energy takes ideas and inspiration and turns them into a plan of action. Be with your awareness of this energy. Take a deep breath in and as you exhale, release any messages, thoughts or perceptions that no longer serve you. With each breath that you take, affirm that Source energy is assuring that energetic flow attracting your Highest manifestation in the physical realm. The energies of the physical now flow to the spirit as the solar plexus flows to the emerald green of the heart. This energy that is centrally located in the chest is the energy of “I love.” This Divine love is the message of Source to us that lets us know that “what is loved within our hearts is the message of our souls to manifest in our reality.” Be with your awareness of this energy. Take a deep breath in and as you exhale, release any messages, thoughts or perceptions that no longer serve you. With each breath that you take, affirm that Source energy is assuring that energetic flow serves your Highest Source of Unconditional Love and Desire. The emerald flows to the pure blue of the throat chakra. This swirling energy is located in the mid throat and speaks our truth – our authentic self. This energy gives us the solidity of the soul’s messages and it gives us the thinness of the messages of our egos. Be with your awareness of this “I speak” energy. Take a deep breath in and as you exhale, release any messages, thoughts or perceptions that no longer serve you. With each breath that you take, affirm that Source energy is assuring that energetic flow resonating with your Divine voice of soul intent. The pure blue blends into the indigo of the third eye chakra of the central brow. This is the energy of “I see.” This sight moves beyond all boundaries and links the Source direction to the visual journey. Be with your awareness of this energy. Take a deep breath in and as you exhale, release any messages, thoughts or perceptions that no longer serve you. With each breath that you take, affirm that Source energy is assuring that energetic flow revealing your Highest path and vision. The indigo flows to the opalescent energy of the Higher Source. This energy is felt at the crown of the head. This is the Divine “I am.” This energy is the connection to our Highest Source / Spirit Guide that is always of Creator God Source. The messages of this energy are always affirming and uplifting. Be with your awareness of this energy. Take a deep breath in and as you exhale, release any messages, thoughts or perceptions that no longer serve you. With each breath that you take, affirm that Source energy is assuring that energetic flow serves your Highest communication that supports and re-affirms our sense of Divine Source in Physical Self. Your awareness shifts to the warmth radiating from above your crown. You sense a golden sphere of energy above your crown – the energetic sphere of Divine Source. Source energy affirming your creation of Highest Intent. Source energy that aligns you with your inherent right to be nourished and to thrive. With each breath that you take, you allow the flow of energy to reach toward you. With each breath, allow this warming golden energy to flow through each chakra. Sense the golden rays flowing through each energetic vortex. Feel the vibrational attunement of Divine Source. From Crown to Root, you know that you are the physical creation of Divine Creator. As Divine energy moves through the root, you release the flow through the soles of your feet into the nourishing earth. You affirm the energy of “As above – So below” magnetic creation. As you feel comfortable, allow your focus to shift from the inner energetic planes to the physical body. Each breath that you take gives your physical body more definition and distinction. With each breath, you gain clarity to your physical place and position. You feel the firmness of the physical plane. Take a deep breath in and as you exhale, release any floaty or extra energy through the soles of your feet and into the earth. Open your eyes and acclimate back to the physical presence. 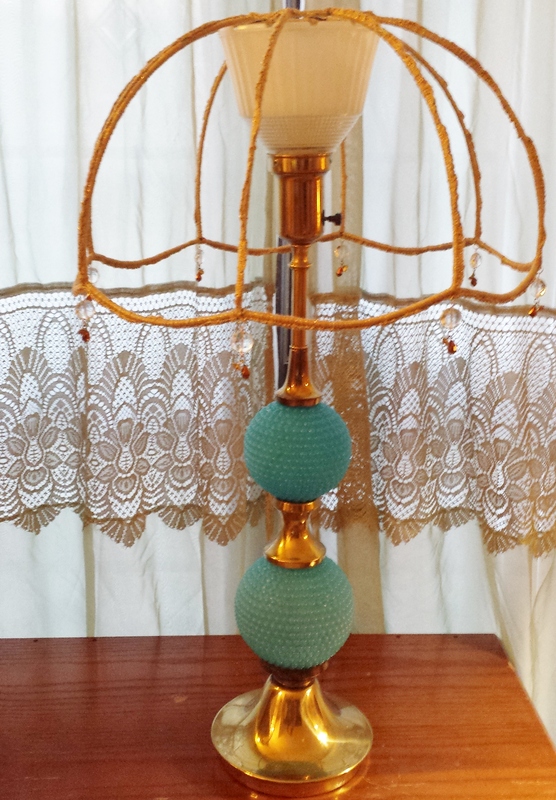 This beautiful cane lampshade used to sit atop a large table lamp that belonged to my grandmother. 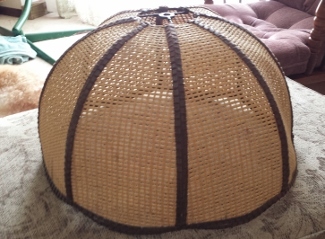 My grandmother stated that the lamp was a “decadent” purchase that she made in the 1920’s. Over the years, the lamp had degraded and had been discarded. But the shade escaped the trash heap. By the time that I received the shade; the caning and the leather binding was brittle and torn in several places. The cost to repair was well beyond my skill level and well beyond my budget. However, the cost of upcycling was well within my skill level and well within my budget. Here are the steps that I used in the upcycle process. Of course, with any creative endeavor, there are an infinite number of possibilities and potentials that can be explored. I removed the cane and the leather binding. Removing the glue was quite an undertaking. Apparently “they” knew how to make glue back in that time. After several episodes of glue – goning, scraping and sanding, I decided that the glue that remained had earned its right to live on through the upcycling. Since the remaining glue left some uneven surface areas on the lamp shade’s frame, I decided to cover the frame instead of going for the repaint option. I have seen many cute designs where lamp frames have been covered by strips of fabric. While I am a fan of the cottage chic styling; I wanted to celebrate this frame’s design and era by going toward the subtle glitz of “late Victorian parlor.” Crochet seemed to fit that bill. I worked two strands of size 10 metallic crochet thread together. Using a size “E” hook (3.5 mm) I worked single crochets around the vertical stays. Since crochet thread has a tendency to “relax,” I worked the stitches very close together and with a tight tension. I didn’t keep an exact stitch count, but I did maintain an approximate stitch count per section to maintain evenness of appearance. (note that one design option would be to create swags between the stays. This would be easy to do with the single crochets and you would want to keep track of the stitch numbers to ensure an even swag) To help keep the vertical stitches from sagging, I hooked around to beginning stitch of each swag as I did the single crochets of the top ring. I repeated this with the last single crochet stitches with I single crocheted the frame’s bottom ring. 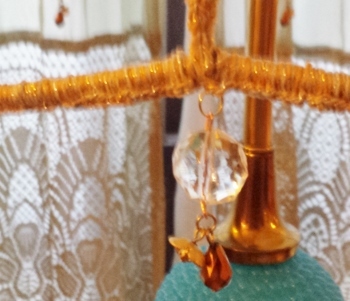 The final upcycle of this shade was the placement of the “jewelry.” I could have gone wild with swaging vintage beads, crystals and assorted adornments. But I had to keep in mind that I was going for “late Victorian parlor,” not “late Victorian brothel.” I stacked some crystals (from a broken necklace on a jewelry headpin and stitches them in place in the valleys of the bottom curves. Currently I have this shade atop a blue hobnail lamp that I purchased at a church rummage sale back in the 1980’s. BUT, at some point, I would like to make the shade into a pendant lamp with a great Edison bulb at its center. 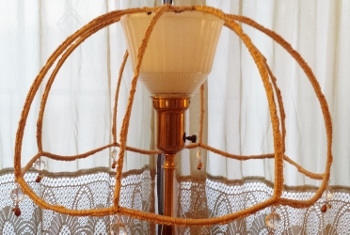 I am certain that this upcycle won’t have the durability that the original design had, but I am glad that I could “save” a beautiful piece of design history (the lamp frame) from the landfill.